The Bermuda School of Music will be hosting the Bermuda Piano Festival from Monday, May 15 to Wednesday, May 17 at Masterworks, with a Piano Festival Masterclass on Tuesday, May 16. The Festival will include ‘Scott Joplin and His Legacy’ on Monday, May 15 at 7.00pm at Masterworks, an evening of piano music by Scott Joplin, William Bolcom, Igor Stravinsky, Nikolai Kapustin, William Albright, Zez Confrey and George Gershwin. 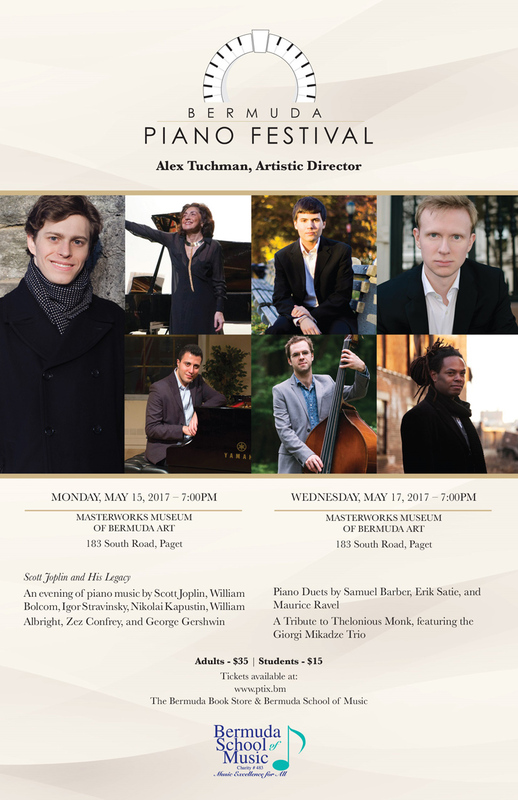 On Wednesday, May 17 at Masterworks, a Tribute to Thelonious Monk will be held, featuring the Giorgi Mikadze Trio and Piano Duets by Samuel Barber, Erik Satie and Maurice Ravel. Tickets cost $35 for adults and 15$ for students and are available at ptix.bm, the Bermuda Book Store, and the Bermuda School of Music.